The yearly Single Barrel releases only use one of the famed 10 Four Roses recipes. The last time OESK was used was in 2012, which was bottled at a somewhat younger 12 years old and at about 109 proof. Tasting the 2016 — Elliott’s first solo release as master distiller — reveals plenty to like. It’s a much different whiskey than the 2012, which is today showcasing butterscotch, gingerbread, and loads of baking spices before heading toward a winey, very sweet chocolaty finish. In contrast, the 2016 offers aromas of marzipan, green olive, barrel char, and a little toasted coconut. The palate deftly blends sweet and spicy, notes of black pepper folding in nicely to those of a crusty fruit pie, more almonds, vanilla, and some curious notes of fig and — again — green olive. The interfplay is fun. The finish woody but easily approachable. Altogether a very solid whiskey for Mr. Elliott. Let’s see what’s next. As a single barrel release, proof varies; figure around 116.8 proof. 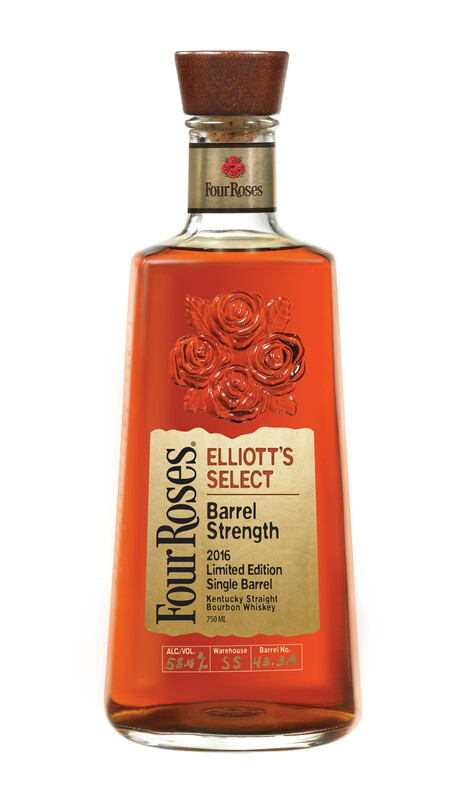 Four Roses 2016 Limited Edition Single Barrel Bourbon "Elliott's Select"